Robots are getting more and more complex, they often require additional of multimedia, network communications, and image processing capabilities. The traditional PC system eats a lot of power which is critical for most battery operated mobile robots. This mini270 IPC has low power consumption chipset, the whole power consumption of the system only has 12W which is really great. It comes with a beautiful black aluminum alloy chassis. 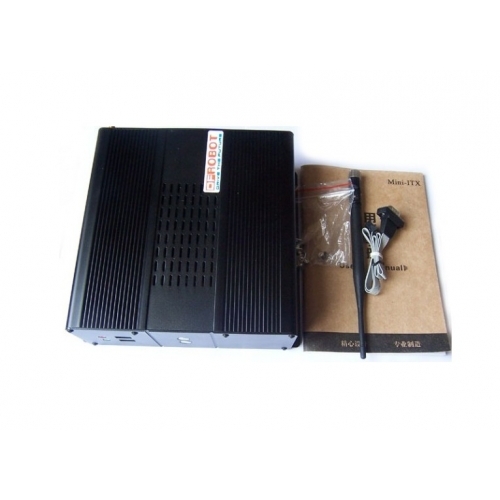 It comes with a fully assembly system with 16G SSD harddisk and 802.11 b/g wifi capability. The 16G SSD hardisk gives a great benefit for mobile robot application. It supports both windows and Linux system, most robot software can run on this platform. It is the recommended high end controller for our HCR, 4WD mobile robot platform. Apply Range ATM, Kiosk, Digital Signage, and Living Room PC etc. Get Fanless Intel Atom N270 with Onboard 12v DC Mainboards (SKU:DFR0020) from DFRobot Store or DFRobot Distributor.